Online credit card fraud is worrisome, but these common-sense tips can help you protect your identity and finances. Just as you don't judge a book by its cover, don't judge a little-known retailer by its home page. Even though there are protections in place to limit your liability when your credit card information is stolen, you certainly don't want to be an easy target. One thing you can do to help protect your identity and finances is to dig a little deeper to determine whether a company is legitimate. A reliable company should list its physical address, not just a post office box or phone number. Call the phone number listed to make sure it works and you can talk to a real, live human being during business hours. At the very least, you should get a recorded message during off-hours. Be suspicious if the phone just rings and rings. Look for clues that a site is secure, such as a closed padlock or unbroken key on the screen where you type in your credit card number. There should also be an "s" after the "http" in the URL to indicate the site uses encryption technology, which scrambles personal information, such as a credit card number, when it's transferred from your computer to the retailer's system. Avoid a business that uses free e-mail, such as hotmail. Send a query by e-mail to see what kind of response you get. Research the company's reputation online. Type in the company's name and "reviews." Check whether any complaints have been filed with the Better Business Bureau where the business is located. Be cautious about dealing with companies located outside the United States. Foreign companies are not subject to the state and federal consumer laws that protect you when buying from companies in this country. A professional-looking website isn't a guarantee that a business is reputable, but a site that contains grammatical and spelling errors merits suspicion. Nearly every reputable online company provides details about how it processes orders. Make sure the company has a privacy or security policy, and check what it says. Don't trust extraordinary claims or unbelievably low prices. Start with a small order when first doing business with an online retailer, advises the Privacy Rights Clearinghouse, and consider using "virtual credit cards." Most credit card companies offer customers the use of temporary one-use numbers for shopping online to prevent identity theft. 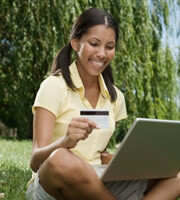 0 Responses to "10 red flags for avoiding credit card fraud online"